Krovostok (Кровосток) is a Russian hip-hop group from Moscow. 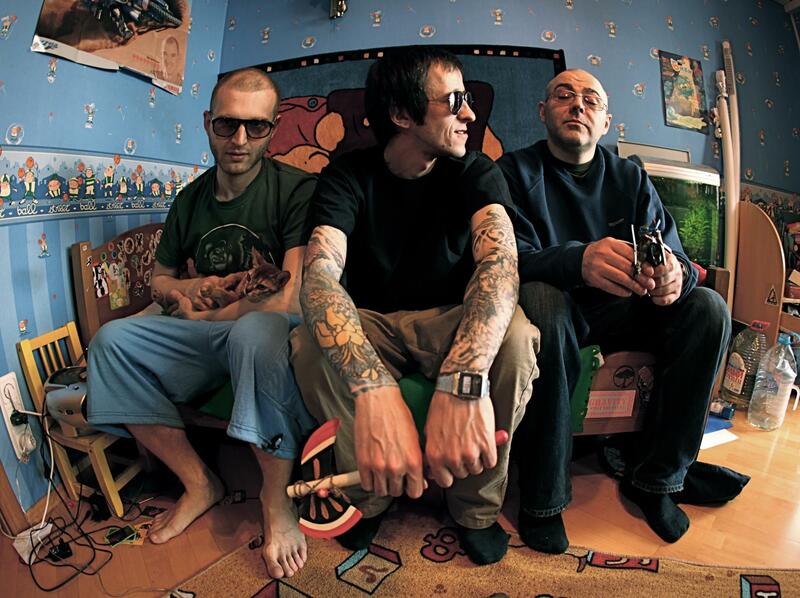 Formed in 2003, Krovostok consists of Shilo (Шило, stage name of Anton Chernyak, Антон Черняк) on vocals, producer Feldman (Фельдман, stage name of Dmitri Fain, Дмитрий Файн), and beatmaker and backing vocalist Fantomas 2000 (Фантомас 2000). The band is know for their liberal use of profanity and the gritty subject matter of their lyrics. Shilo and Feldman met in art school at the Moscow State Academic Arts Faculty in Memory of 1905 (Московское государственное академическое художественное училище памяти 1905 года), where they both participated in the art group Fenso (Фенсо). Both also participated in the multimedia anti-fascist arts collective PG (ПГ), also known as Anti-Tank Grenades (Противотанковая граната). Also a poet, Shilo began writing lyrics, which Feldman would then set to break-beat-style beats. Krovostok’s first eight songs came out on their website, Krovostok.ru, and were later released as a full-length album titled River of Blood (Река крови) in 2004. That same year, the group started to perform in clubs around Moscow. In 2007 Krovostok released several more tracks online, including “Dumbell” (“Гантеля”), “GES” (“ГЭС”), “Kisa” (“Киса”), “Night” (“Ночь”), and “Methadone” (“Метадон”). All these tracks would later be released on the 2008 album Dumbbell (Гантеля), which Fantomas 2000 produced. This album had a higher-quality sound than River of Blood, and greatly increased the band’s popularity. In 2011 Krovostok released their single “Imagine” (“Представьте”), which dealt with themes of murder and drug trafficking, as well as “Stuffy” (“Душно”) and “Time to Go Home” (“Пора Домой”). The last track was released to coincide with Russia’s Criminal Investigation Employees Day (День работников уголовного розыска России). The following year a new album, Jelly (Студень), came out for as a download online. Krovostok’s most recent album came in 2015. Titled Pawn Shop (Ломбард), this album is by far their highest quality in terms of sound and composition. Recently Krovostok has become somewhat infamous, after the group became involved in a lawsuit with the government of Yaroslavl. First it was determined that Krovostok concerts were forbidden to people under 18 years of age. Later, certain content on the band’s website was deemed illegal and banned. Following an appeal by Shilo, the ban was overturned in 2016.